Should I go to a seminar? Each of the following twenty suburi should be practised carefully and with feeling. Breathing is very important and you should inhale before you start the movements, allowing your breath to pass out of your lungs as you perform the suburi, and exhaling sharply as you finish the final thrust or strike of the suburi. Always check your posture at the beginning and end of each suburi to ensure that you have started and finished correctly. Good posture before and after performance goes a long way towards correct posture during the suburi. CHOKU TSUKI - This is the basic thrusting movement which is featured in many of the jo waza (jo techniques). Commence in basic posture, hidari hanmi, with the jo resting on one end vertically on the mat immediately in front of your left foot. Hold the jo with your left hand. Reach down with your right hand to grasp the jo near its base. Your left hand should lift the jo as you do this. Slide your right hand down to the end as you bring the jo to a horizontal position, tsuki no kame. Slide the jo through your left hand back and then forwards, swinging your right hand up to the front of your centre. Both feet slide forwards as you lower your posture during this forward thrust. KAESHI TSUKI - This is actually a counter to a thrust from your opponent. Commence in left posture as for the first jo suburi. Grasp the top of the jo with your right hand, thumb downwards. Bring the jo up in a circular motion as you move to your left with your left foot, bringing your right foot around to remain in hidari hanmi. As you move, thrust the jo forwards to your opponents centre, your left hand on top of the jo. Expel your breath explosively as the thrust is performed. USHIRO TSUKI - This is a thrust against an opponent who is behind you. Commence in basic posture as for the previous suburi, bringing your right hand to the top of the jo, thumb upwards. Lift the jo placing it along the underside of your left forearm while sliding your left foot back beside your right. Step back with your left foot, thrusting the jo straight to your rear and turning your body to your left as you do this. TSUKI GEDAN GAESHI - This is the first of two combinations of movements which incorporate the first jo suburi. Commence in hidari tsuki no kamae, holding the jo horizontally in your left hand with your right hand at its base, your feet in left posture. Swing back with your right hand to make choku tsuki (first jo suburi), sliding your feet forwards. Slide your left hand towards the front of the jo, and step backwards and to the right, remaining in left posture as you push the jo back past your right side through the right hand. Turn your hips to the left, stepping forwards with your right foot, and bring the jo around at knee level to strike at your opponents lower legs. Your right hand should be behind the jo pushing it round to make contact. TSUKI JODAN GAESHI - This combination introduces the striking techniques which are to follow in the next five suburi. You commence in hidari tsuki no kamae. Swing back with your right hand to perform choku tsuki, sliding your feet forwards. Move backwards and to the right, still in hidari hanmi, bringing the jo up to protect your head (sliding your right hand up to your left). Tum it over your head to the striking position in preparation for shomen uchi strike (right wrist twists, left hand moves to end of Jo). The strike is performed by swinging the jo in an arc over your head and down onto your opponent as you step forwards with your right foot. SHOMEN UCHI KOMI - Commence in right posture holding the jo in front of you with your left hand at the end of the jo and your right hand a quarter of the way up. Step back with your right foot, raising the jo above your head, pointing it towards the ceiling and angled slightly back. As you step forwards with your right foot, bring your hands down and forwards, striking with the jo to your opponents centre. RENZOKU UCHI KOMI - Commence in right posture and perform shomen uchi komi (sixth jo suburi). Having performed the strike in right posture, move your weight forwards on to your right foot and bring your hands up to the front of, and just above, your head with the jo pointing to your right. Step forwards with your left foot, turning your hips into left posture. Bring the jo round to extend behind you and make hidari shomen uchi to complete the suburi. MEN UCHI GEDAN GAESHI - Commence in right posture and perform shomen uchi komi. When the strike is completed, extend your right hand to the end of the jo, sweep it back to your left side and move back and to your left. Step forwards with your left foot. Bring the jo round in a strike to your opponent's knee, keeping your left hand behind the jo to give power to the strike. MEN UCHI USHIRO TSUKI - Commence in right posture and perform shomen uchi komI. As the strike is completed, slide your right hand to the forward end of the jo, turn your hips into left posture and perform a thrust to the rear as in ushiro tsuki. GYAKI YOKOMEN USHIRO TSUKI - Commence in right posture as if you had just completed shomen uchi komi, bringing your hands up to the front of, and just above, your head with the jo pointing to your right. Step forwards with your left foot and perform hidari shomen uchi. Slide your left hand to the front end of the jo, turning your hips further into left posture and perform ushiro tsuki to your right side at chest level. KATATE GEDAN GAESHI - This is the first of the suburi which features one-hand grip and uses wrist movement for successful completion. Commence in hidari tsuki no kamae, sliding your left hand to the forward end of the jo. Push the jo back through your right hand, bringing your body back and to the right as in the fourth suburi. Both hands should now be at the forward end of the jo. Take a long step forward with your right foot, sweeping the jo forwards across an imaginary opponent's face, holding it with your right hand only and catching it with your left hand over your head on the left side after the sweep is complete, finishing in a defensive position. TOMA KATATE UCHI - This movement is used to extend the jo forwards to reach a considerable distance past your normal fighting range. Commence in hidari tsuki no kamae and draw the jo back over your head to your left with your right hand, resting the forward end of the jo on your left forefinger/thumb cleft. Draw your weight back onto your right foot. As you start to swing the jo around with your right wrist, commence stepping forwards with your right foot, swinging the jo at your opponent's head and around to be caught by your left hand down by your left hip. KATATE HACHI-NO-JI-GAESHI - This incorporates a double wrist action to loosen your wrist and serves as the precursor to the hasso techniques that will follow. Commence in left posture. Hold the jo in your right hand on your right side, the end resting on the mat. Tum your wrist forwards, raising the jo and, while stepping forwards with the right foot, sweep the jo across your imaginary opponent's face. catch the jo high on your left side in your open left hand. Swing your hips back to the right, changing posture into hidari hanmi while stepping back with your right foot as you push the jo across to your right with your left hand. Spin it around your right wrist, catching the short end in your left hand, beside your head on your right side. HASSO GAESHI UCHI - The next five suburi all incorporate the hasso technique which consists of rapidly twirling the jo from a forward position under your wrist and up to above your right shoulder beside your head, as you do to complete the thirteenth suburi. Commence in ken no kamae, sliding your right foot back as you extend your left hand forwards and upwards, letting your right hand slide a little further towards the centre of the jo. As you step back with your right foot, push sharply down with your left hand on the jo to swing it down and up to your rear. Grasp the bottom end with your left hand as it comes to a vertical position at the right side of your head in hasso no kamae. Start to step forwards with your right foot as you bring the jo up to your head changing the grip with your right hand, and complete your step forwards as you strike with shomen uchi in right posture. 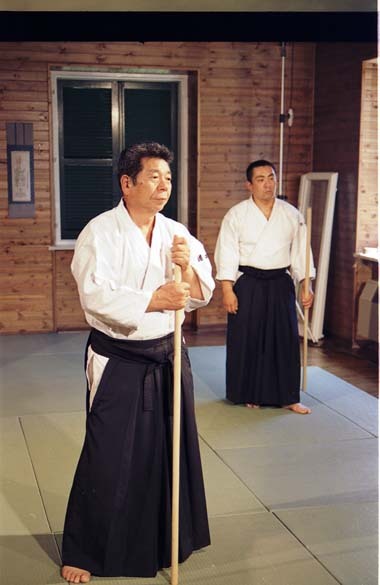 HASSO GAESHI TSUKI - Commence as in the previous suburi twirling the jo to assume hasso no kamae. From this point, extend your left foot forwards, bringing the jo down to perform a straight thrust to your front. Slide your right hand forwards and perform hasso gaeshi once more, bringing your left foot back a little to finish in hasso no kamae. HASSO GAESHI USHIRO TSUKI - Commence as in the previous suburi by twirling your jo to assume hasso no kamae. From the vertical, drop the top of the jo forwards, extending your left hand to its front end and thrusting the jo to your right rear (migi ushiro tsuki). Finish with your hips facing to the right. HASSO GAESHI USHIRO UCHI - Commence as in the sixteenth suburi assuming hasso no kamae. Tum your hips further to your right and strike down and around to your rear with a round sweeping blow, keeping your feet in the same position as they were in hasso no kamae. HASSO GAESHI USHIRO HARAI - Commence as in the previous suburi assuming hasso no kamae. Tum your whole body to the rear, sweeping your right foot back and round whilst swinging the jo in a sweeping strike to an imaginary opponent who is standing behind you. HIDARI NAGARE GAESHI UCHI - These final two suburi are designed to help improve your body movement as they incorporate a flowing combination of strikes. Commence in ken no kamae (right posture), stepping back with your right foot to perform shomen uchi komi (sixth suburi). As the strike is made turn to your left, bringing the jo around as you extend your left hand forwards to catch it. From here, take the jo back over your head. You should now be facing your rear as you perform right shomen uchi strike to the imaginary opponent who is now standing in front of you. MIGI NAGARE GAESHI TSUKI - Commence in ken no kamae, stepping forwards to perform hidari shomen uchi. As you complete the strike, step back and round with your right foot, turning to your rear to block across your head Lower your hands into hidari tsuki no kamae and perform hidari choku tsuki to deal with the imaginary adversary behind you. Here are a few exercises which will help improve your accuracy with a bokken (or jo for that matter). For shomen uchi: Have a partner hold a jo horizontally in front of you so that the jo is parallel with your shoulders. The jo should be fractionally below the height of your natural cutting action. You should make a few practice cuts to establish the correct height. With the jo in place, cut shomen uchi repeatedly with your bokken, trying to come as close to the jo as possible without touching it. Your partner can indicate how close --- or far away :+) --- you are. Aim to cut with the last couple of inches of your bokken. Try not to look down at the jo, look straight ahead instead. Yokomen uchi: Have your partner sit seiza directly in front of you and hold a jo vertically. With your bokken, cut yokomen uchi alternately to the left and right of the jo. Again, the idea is not to touch, but to come very close. Once you get the hang of these you can ask your partner to move the jo about a bit. Hopefully your cuts will remain consistent as you adjust your position and posture to cope.